While many foreigners will generally find Indonesia an irresistible holiday destination, Steven Graaff saw it as the ideal place where he can put into practice what he has learned from his medical studies abroad. He also aims to satisfy the unique medical needs of expats and natives alike in the archipelago. Having been mesmerized by Indonesia’s unique fusion of simplicity and grandeur even as a child, Steven Graaff knew early on that the country would have a special place in his heart. Apart from his frequent visits to the archipelago every now and then growing up, his master’s thesis was on HIV/AIDS in Indonesia and he interned for a couple of hospitals in Jakarta as a young man. And although they met in the Netherlands, the woman he ended up marrying is also Indonesian. The decision to move to Jakarta was settled when Graaff was offered a job as an expat medical advisor with an international assistance company. His previous jobs at the National Health Service in the United Kingdom and the International Health Center in The Hague exposed him to various needs of patients of different nationalities. These experiences helped him understand more the needs and expectations of the expatriate patient community in Indonesia. Four years after moving to Jakarta, Graaff decided to establish his own medical practice. But this wasn’t your average clinic. Graaff saw limitations of the Indonesian healthcare providers, so he knew he wanted to create something similar to the healthcare service expats were used to getting in the Netherlands and the UK. He wanted to put up a place where a patient would see the same doctor, where medical notes are electronically kept and well organized in a database, and where patients will be taken care of according to international medical standards. From this, Good Practice was born. 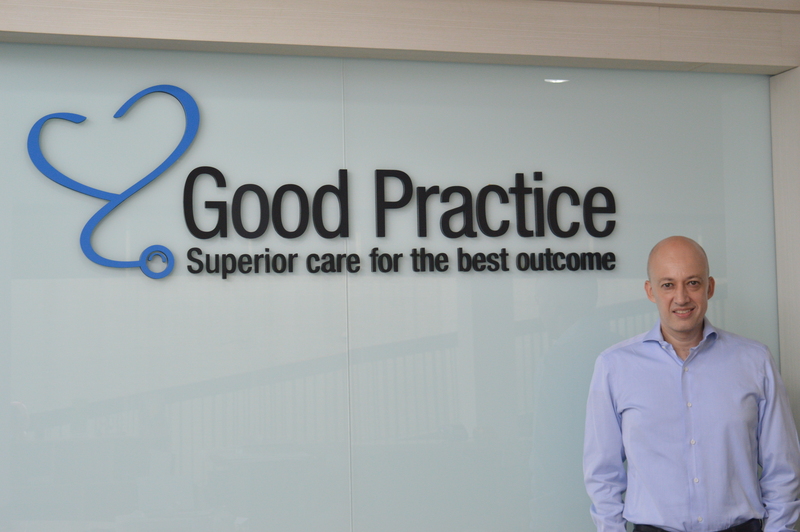 Located in the heart of Jakarta, Graaff’s business Good Practice aims to be recognized as the city’s leading evidence-based medical provider. The family medicine clinic looks to consistently provide excellent medical services and primary care for the entire family, while keeping up to date with the latest in medical and healthcare research. Graaff also takes pride in fully complying with international guidelines. Good Practice aims to meet the needs of the international community in Indonesia, as well as those of locals searching for the highest quality of medical care. Graaff told Indonesia Expat that to ensure company culture is maintained and the primary purpose of Good Practice is carried out for its clientele, his staff must stay on top of things. He explained that while he is not practicing as a doctor, he has never stopped studying and getting professional training from a variety of medical courses including cardiology, ophthalmology and more. In addition to being knowledgeable with Dutch medicine, Graaff is also well-versed in the British Medical Journal modules, which he explains is essential if Good Practice wants to stay current. The CEO emphasized the significance of having a closely knitted team, which gives them a communal sense of responsibility to look after the well-being of Good Practice’s patients. As a team largely built on accountability and trust, they are able to easily discuss relevant matters and come up with fact-based decisions right away. The closeness provides accountability, and therefore makes everyone more likely to go the extra mile for patients, Graaff said. In terms of support from the local government, Graaff was thankful to the Good Practice staff who helped throughout the entire process at the levels of kelurahan, kecamatan and walikota (village administrations, districts and the city). He’s also grateful to the Dutch community in Indonesia for being supportive in spreading the word about the unique healthcare facility. Although 90 percent of Good Practice’s clients are expats, plans of catering to a larger Indonesian audience are underway. Good Practice is currently taking care of three generations of a few Indonesian families, thanks to positive word of mouth from other patients. “At Good Practice, we find it significant to know someone’s family so we know more about every family member’s medical condition and history. It plays a critical role in every patient’s life,” said Graaff. Graaff says he personally likes the challenge of helping expatriates, particularly in terms of settling in and getting them oriented with health and life in Jakarta. Good Practice makes personalized referrals for its patients in and out of Jakarta and provides specific health guidelines for newcomers in Indonesia. “Having experienced the expat life ourselves, my wife and I understand how relocating to a new country can be a big challenge. We felt that a family medicine practice as we know it in Europe did not exist in Indonesia. That and our experience served as our motivating factors to establish Good Practice,” Graaff added. Ten months after it was established, Good Practice currently has patients from 39 nationalities, which “means that a lot of different patients appreciate our concept,” the doctor said. In terms of competition, Graaff admits that its new clinic has to compete with big clinics and hospitals and deal with the fact people do not find it easy to identify a good facility or a good doctor in Jakarta. According to Graaff, Good Practice is most proud with its team of experienced doctors who are keen to listen to every patient’s complaint, do a prompt physical examination and discuss management plans with them. “We understand that health is not just the lack of illness but being well in the body, mind and spirit. At Good Practice, we know the hallmarks of primary care medicine. Preventive care, coordination of care for the ill and continuity of care achieve better health outcomes,” Graaff explained.